New Zealand is planning to release a rabbit virus across the country, in an attempt to cull the ballooning wild population. 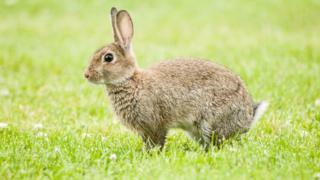 Wild rabbits are seen as a pest in parts of the country and the virus, known as RHDV1-K5, will be released from March. Farming groups have welcomed the move while others have raised concerns including the risk it may pose to pet rabbits. Why are rabbits such a big problem in New Zealand? Rabbits were introduced to New Zealand around the 1830s and have long created problems for farmers. Wild rabbits compete with livestock for pasture and also cause land damage from burrowing. According to the Ministry for Primary Industries (MPI), rabbits cost an average of $50m New Zealand dollars (U$36m; £18.7m) in lost production and more than NZ$25m in pest control each year. How can you control a rabbit population? The main methods are shooting, poisoning, fumigation of burrows and, less drastically, installing rabbit-proof fencing. But officials argue the problem has got so big those solutions don't go far enough. An earlier strain of the Rabbit Haemorrhagic Disease Virus (RHDV) was introduced to New Zealand in 1997. The virus, which only affects rabbits and not other animals, was initially very effective but after more than 20 years, the rabbits have become immune to it. The virus due to be released next month is a new Korean strain, known as RHDV1-K5. It affects an animal's internal organs, causing fever and spasms, blood clots and respiratory failure. According to the MPI, this strain works faster, killing rabbits within two to four days of infection. New Zealand's Federated Farmers (FF) said the move was a "huge relief". "There are some desperate farmers out there," the spokesman Andrew Simpson told the BBC. "If another year goes by without [the] virus, the ecological damage to some properties would be mind-numbing." But Arnja Dale, from the Society for the Prevention of Cruelty to Animals, said the decision to release the virus was disappointing given "the suffering it will cause affected rabbits and the potential risk to companion rabbits". "[We] advocate for the use of more humane methods," she said. The SPCA says a vaccine which is being made available for pet rabbits has not been "adequately tested...[with] not yet sufficient evidence that it will provide sufficient protection". But the MPI says vaccinated domestic rabbits will be safe. It said RHDV1-K5 was released in Australia last year, with no reports of vaccinated pet rabbits dying from the virus strain.